Offer your guests the love of the Lord with a magnificent and uniquely crafted Cross! Religious occasions call for a special and meaningful gift and you have found the ideal choice with this stunning cross. Thrill your guests when they find one on their event tables. > Our cross is crafted from metal with a shiny silver finish. It features an intricate twisting of molded open rings that create a fabulous two dimensional look. 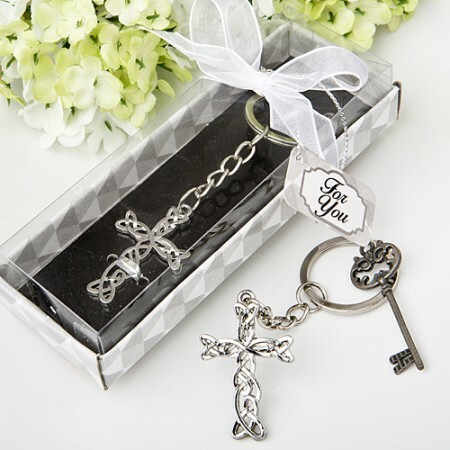 The cross attaches to a metal chain and key ring, making it a useful favor that your family and friends will always keep close at hand. This dramatic cross is a great expression of Christian faith and is sure to be treasured by your guests. Size 1 1/2" x 1"
This product will be in stock on Saturday 20 July, 2019.